The site is to the east of the town centre, between Trinity Road and Chapel Street at NG SU 84989:86878. 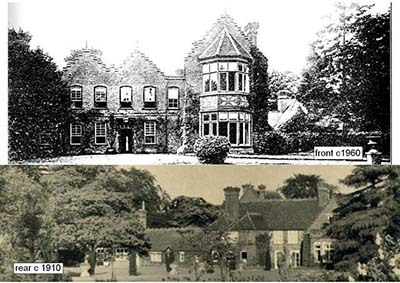 This is the location of a significant 18thC farm, which was replaced by a large house in about 1850, this was subsequently altered and extended, being demolished in the 1960's and the area turned into a park (see photos below). It is possible, even likely that the farm or a predecessor is much older than 18thC. Also intriguing are hints in the record of a Chapel, possibly dating to the 15thC or before. We are indebted to Tony Reeve for the historic research and considerable assistance. An investigation is currently underway using historical research, survey, resistivity and excavation. There are two reasons for this extensive investigation. MAS is endeavouring to record all heritage assets as part of the Local Asset Register, so that when any decisions are taken by the Authorities, the impact on heritage has to be considered. Also very significant is that when Transport for Buckingham improved the path across the site they revealed structure but this was not recorded as required by the guidelines. When WDC and County were questioned they stated that they had no knowledge of any structures on the site. Whilst this is difficult to believe we thought that we had better record what remained, somewhat urgently. Luckily we have several maps that show buildings, including Tithe maps, early OS etc. Also many early photographs, apparently from the late 19th to early 20thC. 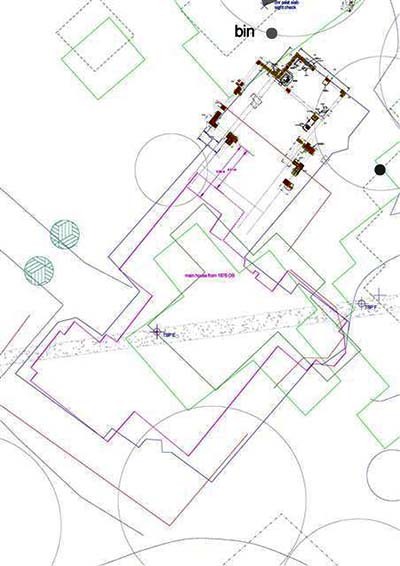 An accurate survey of the site was carried out and when plotted this map information, plus photo rectification and resistivity interpretation was also plotted. This provided a lot of information but a major problem. The process of copying and plotting the maps is not accurate and the resistivity was difficult to interpret due to the spread of demolition. Also it was realised that the different maps showed buildings in different configurations as alterations took place. Some idea of the complications can be seen on plot below. The different colours are the plots from the different maps. The approval from WDC was limited, requiring minimum sized trenches, closed each day for reasons of safety. Clearly we had to position trenches, as far as possible, over likely structure or we could waste a lot of time, not an easy thing to do in this situation. By good luck it was noticed that a small part of a structure was showing through the grass but what this was or what part of a building was at that time unknown. It was decided to start with this and then follow the structure with successive trenches, so as to be able to plot buildings revealed and hopefully understand the layout. Small teams of MAS have been doing this over many weeks and it continues. Whilst successful, even this wasn't easy, as we came to realise that there were probably several buildings each having been extended and altered, also parts of the structure had been pushed over and moved during demolition. We have called this part of the building the annex for identification. The visible parts was revealed as a concrete machine base, within a brick building. Another similar machine base was later revealed slightly to the NE. The foundations were followed round the building. This end of the structure is assumed to be a single storey building that the documents indicate was built in 1919. The purpose of this building is as yet unknown but it was of some quality, having render and fair face plastered walls, a stone door cill, plus evidence of glazed wall tiles and linoleum floor on a concrete slab and screed. The purpose of the machine bases is also obscure, one having 4, ¼" studs the other 4, ½" bolts, plus indications that they both held an H shaped stand. Machines having cast iron stands of this configuration were common during this period. About half way down the E wall was found a large ash pit, when plotted it was realised that the position was consistent with a large chimney on the photos. The area around this ash pit had suffered considerable demolition damage, making it difficult to establish function. It was larger than would be required for just a fire, possibly indicating a forge or boiler. We are proceeding with excavating the annex in the direction of the main building to determine if it is connected. We hope to complete the outline of the annex within a week or so. It is anticipated that this will lead us to the east main end wall of the house. When this is found it will be followed to the SE where it crosses the path. It is at this point that the various plots mentioned above, converge and it maybe that this will enable us to find the c18thC farm buildings which we can then follow. The history information suggests that part of the old farm building were incorporated into the new house. If we can find this it will supply interesting information. There is a great deal to be done which will obviously take a considerable time. The more people who get involved the more we can achieve. Not much is known for certain about early Marlow, so Marlow Archaeological Society embarked on an ambitious series of investigations of a number of sites likely to provide evidence, one of these is Riley Park. Last year, MAS, investigations by terrain, geophysics and probe survey, revealed intriguing features. At the north east corner was a series of anomalies, probably piers for a pavilion. Associated with this arrangement of piers is evidence for an early paved entrance from near the corner of Cambridge Road and Crown Lane. Whilst no direct dating evidence exist it is probable that this pavilion may date from the first use of the site as a park. A further major anomaly was revealed meandering at an angle up the site between 20 to 50m in from the east path. Analysis of the data indicated a ditch like feature with an average width of 4.25m at the top. A worry was that this feature might be a service trench but investigation of the legal documents by the Trust seemed to rule this out. On the 1st March this year the geophysics survey was extended south to obtain a clearer understanding of the main feature. On the day it was very cold but some 9 people braved the weather and did an excellent job made more difficult due to obstruction by trees, shrubs and paths. Great credit is due to Joy Blake who organised the people and Colin Smith who supervised the geophysics despite a damaged knee. All the data now available was re-analysed and plotted. This revealed that the ditch like feature at the south end curved towards the east. Again the analysis indicated a ditch or watercourse of a consistent width through out its length. With the assistance of Dave Greenwood and Tony Reeve, considerable investigation of old maps and documents was carried out to try to relate the feature to anything on these old documents. Whilst not certain there were some indications of a relationship with features on an 1806 map but this map is unreliable. Intriguing is that the feature towards the south end appears to be avoiding something. As early ditches and watercourses often have artefacts washed in that can provide valuable evidence, it is proposed to excavate the feature with one perhaps two narrow trenches. The Trust have kindly given permission for excavation, so long as there is no interference with the football area or public use of the site. In accordance with the archaeological regulations and guidelines, we are now preparing a formal "Written Scheme of Investigation" for County and Trust approval. Subject to how difficult the excavation is, MAS intend this to be carried out as a training exercise. This will involve two sessions, one off site covering theory and practice and on site experience under professional supervision. Only those attending the theory and practice session and showing themselves to be reasonably competent can be allowed to excavate so as not to damage any archaeology but others are welcome to assist. Anybody interested in taking part must register with MAS in advance so that we know how many will be involved. Dates will shortly be announced by MAS. Amersham Old Town nestles in the valley of the River Misbourne and is situated to the S. W. of the larger modern town of Amersham. It is now a collection of quaint shops and attractive old buildings that lie predominantly along one long, wide, street. There is evidence of settlements here going back to prehistoric times, although its name originates from the Saxon name Agmodesham, as recorded in 1086 in the Domesday Book. By the 17th century the town had a large Quaker community, which may explain its strong parliamentarian leanings at that time. Contingents of the parliamentarian troops, who were garrisoned here in the mid 1600's, were known to practice their musketry and gunnery by firing over the river onto the steep slopes on the north side of town. In previous centuries these slopes were also utilised in a more constructive way, they were a necessary component of the local cloth making process – the cloth was washed, stretched and dried on "tinter hooks". Many of the buildings in the high street appear to be Georgian in style, but the large majority of them are much older. Closer inspection of some of these "Georgian" buildings shows that much earlier building styles are apparent; the brick exteriors are just façades on the fronts of the buildings and inside of many of these buildings they are seen to have been constructed in an earlier oak frame, wattle and daub style. In contrast, the front of the 16th century Kings Arms hotel suggests that it is a medieval building – it actually was reconstructed in 1927 to match the half timbered appearance of a building situated next to it. The old town is conveniently placed between London and several destinations – in earlier times it was a major coaching stop. There are still a large number of pubs opening onto High Street and these were at one time either post inns (for private use) or coaching inns (for the general public), and many of these still have large archways to the side of their main entrances, these would have allowed stage coaches to enter into the cobbled courtyards. What was originally a simple 14th century village church, Saint Mary's, is situated at the beginning of Church Street. Over the centuries various additions have made it now quite a large building. Its present flint covered exterior was a "renovation" in 1890; apparently this was a way to use this material when it was excavated in huge quantities to produce a railway cutting. The traditional local cloth industry was so important that it was marked by an ancient, law - the newly dead when buried in the church yard had to be wrapped in locally produced cloth shrouds. In the church yard are graves that are marked by a curious half cylindrical structure, about 4ft in length, which apparently signifies this requirement, with the grave stone at its head. Anyone found not adhering to this law would have been heavily fined. The significance of the church to the community is emphasised by the importance that the local squirearchy of many generations – the Drakes, gave to it. There are large monuments to this family within, and many of whom were also interred in the crypt. One member of the Drake family is particularly remembered for his philanthropic work, a certain Tyrwhitt Drake, and details of his achievements are commemorated, in 1807, on the side of the church. Up until recently Church Street was mainly associated with brewing. Along this street could be found premises to facilitate the work of carpenters and coopers. There is still a master brewer's house in Church Street and a building that was, at one time, the malt house which can be still seen. These trades were all necessary for producing Weller's Beer. The brewery no longer produces beer although the brew house still exists; it has now been tastefully altered for office purposes. The brew house straddles the Misbourne, which would have powered a mill for grinding "grist", this would also have been a direct source of clean water for making beer. There are buildings in the town that stand testament to the philanthropic values of the owners of Weller's Brewery; these were used as accommodation for brewery workers' widows; at a time when the certain fate of a widow was the work house. However, the last owner, George Weller, sold the brewery in good faith on retirement, only for the new owners to promptly close it down. Not surprisingly, the resultant unemployment coursed considerable resentment, and George Weller's memory is not as respected as much as it should be. The Market Hall, built by the squire of the time Sir William Drake, in 1682, lies halfway along High Street. On prominent display on this building, facing onto High Street, is a coat of arms carved from stone – this was to remind the town's folk of the importance of this prominent family. A structure on top of the carved shield – a hand holding an axe was actually part of the coat of arms of Sir Francis Drake and represents an incident on board his ship where Queen Elizabeth I instructed Sir Francis to execute a member of his crew. It would seem that the Amersham Drakes wanted to identify with the Devonshire Drakes; even though there was not actually any relationship between the two families. The neat buildings and shops to be seen now would, in earlier times, have had markedly different functions. There would have been a variety of trades performed by local people for the local community, many spilling into the streets. For example, in front of a shop that would have at one time been a butchers shop there is a metal ring that had been inserted into the kerbside, the ring would have been used to tether bulls destined to be slaughtered at the rear of the premises. There were a large number of butchers on High Street at one time. Among the other buildings that originally served different purposes were three that were work houses, and some others that up to the beginning of the 20th century were alms houses, these were built in 1657 exclusively then for widows. The Nine Worthies house was originally the White Hart coaching inn (this has nine paintings on a wall painted in 1550 representing heroes from classical times and biblical figures, i.e. worthies). A grammar school, that had occupied a building since 1626, was moved to larger premises in 1927; it is now a small shop at the S. E. of town. The Dowager House at the N.W. end of High Street was once the manor house. If one ascends a road up a slope on the south of the high street (the other side of the valley) one passes the Kings Church (a Baptist church opened in 1700), which has a plaque on the side of the building commemorating the opening of a school here in 1842 – a "British school", the first state school to operate in this part of Buckinghamshire. At the top of the slope we were shown "the Platt", the oldest road in Old Amersham Town, this is a narrow, winding, track that derives its name from a local dialectic term for hazel nuts. As you descend back into the town you look down upon the 18th century rectory, a beautiful house set in its own grounds, in the garden is a well-house where, in living memory, it was still worked by a horse. Famous individuals who had connections with the town include William Penn who lived at Bury Farm at the foot of Gore's Hill near the S. E. end of High Street and who subsequently married the lady of the house, Guilielma Springett, who accompanied him to the American colonies. John Knox is said to have preached at Saint Mary's. Oliver Cromwell may have stayed in the town during the English Civil War (Oliver's wife certainly did stay here). And finally, a celebrity of some notoriety was Ruth Ellis, who is buried in an unmarked grave in the cemetery that is situated alongside the Misbourne. This is ongoing with the first two trenches completed and the interim report deposited. The east-west trench T1 revealed a very nice flint knife (thought to be late Neolithic) plus other burnt and worked flint. The north-south trench T2 revealed the bottom of a ditch which coincided with the east-west anomaly on the magnetometer, stratigraphy indicates that this may also be Neolithic but this is not yet confirmed. This project is commissioned and paid for by the Parish Council under PPG16 regulations, requiring supervision by an MIFA and places extra obligations of care on MAS. The proposals for phase 2 are for a long north-south trench T3 at the west end of the site, primarily to see if we can find if the ditch revealed in T2 extends to the west as indicated by the magnetometry but also to look for other evidence. Another long trench is proposed east-west starting at the ditch feature in T2 and hopefully to the same feature if we find it in T3. If there is time and resources a short trench will be opened at the north-east corner to investigate an uncertain but probably more recent ditch revealed at the east end of T1. Phase 2 has been set out, with the JCB starting on Monday 30th June and troweled excavation starting on Tuesday 1st July. The JCB will return for T4 and in all expected to take 2 to 3 weeks. This is a large area and at the same time difficult to identify the archaeology. The final report has been deposited at the SMR. Two trenches were opened in 2007 either side of the 2006 trench which had revealed a fire area with carbonised wood and hazelnut shells and burnt pottery, also stake-holes and much burnt and worked flint. What was revealed in 2007 was at first confusing, consisting of 2 shallow bowl pits, rills, stake-holes and more burnt and worked flints. Of great importance and credit to MAS is the comment in the Specialists final report, "To date, there are no Neolithic archaeobotanical results for Buckinghamshire. As a result, although a limited project, the results gathered by the Marlow Archaeological Society at Low Grounds Farm are of major regional importance." At the bottom of the southern pit was a white precipitate. All was recorded accurately, with samples taken for analysis. When plotted there was seen to be a relationship between all of the features. The analysis showed two important matters, quote from the analysis report, "Chemical tests carried out on the white chemical precipitate sample revealed an alkali residual, possibly derived the processing of animal hides the predominance of scrappers helped to confirm this interpretation. The small gully could also have been used to channel water into and out of the tanning pits". "The identification of possible Neolithic leather processing on site is of notable significance, as few examples are known from this period. The remains of possible tannery pits discovered within Trenches 8 and 9 provides first-hand evidence of leather processing on the site, and more significantly within the region. The organised rows of stake holes in Trench 8 potentially reflect hide drying racks that were part of the tanning process." It would seem that the horizon revealed is the ancient surface. Material from the fire was dated by Carbon 14 analysis to BC 2671 to BC 2814, i.e. mid to late Neolithic. As this dated material was from the same horizon as the other finds and features both in 06 & 07, it is probably reliable to suggest that all the finds and features are of a similar date and period and this with other evidence is starting to build a picture of Neolithic activity. Another important aspect was what the evidence indicated about the environment and nature of Neolithic occupation, "The tentative palaeo environmental information obtained from the pollen and charred plant assessment indicated that the activity on the site was occurring within a largely treeless landscape consisting of possible grazed grassland and dandelions. The environmental samples potentially indicate a mixed subsistence of cereal growth, foraging and animal husbandry. The remains of charred cereal grains and chaff from Trench 7 indicate that cereal crops were being cultivated on the site. ." "However the evidence of occupation, leather processing and cultivation on site may suggest that more long-term settlement was occurring here. It is not entirely clear whether this represented repeated occupation or more continuous permanent occupation of the site." The traditional view of this period is one of extended family units leading a more or less nomadic existence, not being settled in any one location. It is possible that the evidence from Low Grounds is showing a moment when occupation was evolving from hunter gathers to farmers and that not all were nomadic. This has important implications for social structure, possibly indicating that a hierarchy was emerging, perhaps based on ability (leather working, tools etc.) with the important people staying in one place. This has raised the issue of the relationship between the evidence found by MAS and the barrows, thought to be early Bronze Age as there is the possibility of overlap. As can be seen the project produced very significant and thought provoking evidence, showing what can be achieved by amateurs with the ability to work to high standards. We have had discussions with the Environment Agency Archaeologist regarding the proposed works and impact on the archaeology. The information and proposals are broadly: They say that magnetometry between the barrows and track to the east has revealed large circles indicative of settlement. The proposal is to dig a very large balancing lake to hold back flooding, to the east of the barrows. As part of these works the excavated material to be piled on the west side of the field up against the wood. (over the area of our T7, 8 & 9 with the evidence as above. I have expressed doubt regarding the magnetometry evidence and have asked to see the report. I have also written to County to ask if the area of T7, 8 & 9 can be protected and excluded from the works. A good thing maybe that the works area but not the works will include the area of the barrows, no archaeological work is proposed here by the Env. Agency. This could enable excavation by MAS of part of say the central barrow, this has been proposed to both Env. Agency and County, we are awaiting a response. Also agreed with the Env. Agency is that members of MAS and others will be offered the opportunity to work on the main archaeology with the contracting unit. The purpose of this is an endeavour to obtain archaeological evidence from near the centre of the village as there is little if any previous evidence apart from MAS work on the Paddock. A WSI was submitted also a proposal to the owners which has been approved by the local management but approval is awaited from their Estate Dept. This project will involve clearing an area of scrub and rubbish, then opening one trench. The date for this will depend on formal approval and demands of other projects. This is a major project arising from documentation showing Cookham to have been an important part of the Saxon defence system in the late 9thC which enabled Alfred to drive the Danes and Vikings out of Wessex and start to create England. Despite the importance of this to our history, almost nothing is known of its archaeology in Cookham. For background and more detail see MTArcServ review of evidence. 1. A detailed area survey to provide an accurate basis for recording the investigation. There are difficulties in accurately locating this survey due to the lack of fixed points but liaison is taking place to use the Env. Agency fixed survey data. A further site inspection has taken place to plan this survey. 1 One important matter is to accurately find the feature at right angles to Hedsor ditch shown on the MANCAS resistivity survey but not properly recorded. The indications from this resistivity is that this feature is man made and looks similar to other recordings of a bank and ditch. This part of the project will involve as a first phase some 49 resistivity grids and hopefully magnetometry by BARG. Depending on the results these may be extended. 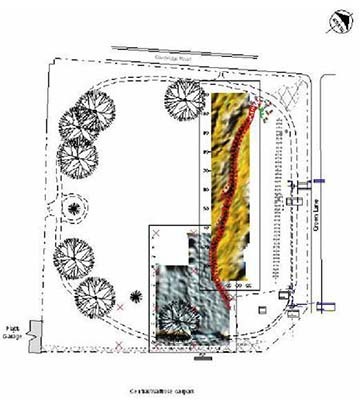 2 If this feature is found then it is proposed to excavate trenches to establish what it is and possibly a date. It is also possible that the c1608 Boston Channel will be revealed and if so trenches will be excavated. The Env. Agency have placed conditions on approval for excavation that, MAS must show that it is competent and has the funding in place for the professional services required. Another matter that came to light during the negotiations was the report by the previous archaeologist of brick foundation on the area between Kings Water and the Lock Cut to the north-east of Odney Common. There is the possibility that this maybe the second mill mentioned in the Doomsday survey but of course there are many other things possible. Apparently this area has never been investigated and if there are any features they should at least be recorded. We have asked for permission to access this area so that we can have a look and decide what if anything needs doing. There is a lot of very important archaeology waiting to be done. MAS has shown that it can do this properly to the satisfaction of both Authorities and professionals as at Low Grounds. A few people have taken the trouble to go on excavation training and courses but if MAS is to continue to be successful more need to do this. On a good day we get more than enough skilled and supporting people but this doesn't always happen and is unpredictable placing a strain on those very few people who always attend. Whilst MAS is an amateur Society, there is no such thing as amateur archaeology, if a find or feature is revealed it doesn't know if this is by an amateur or a professional. Those of MAS who have been on site are very good and respond well to supervision but the regulations are becoming ever more demanding which is a problem for all amateurs. There are those in the profession and at the Authorities who dismiss amateurs as useless but there are an increasing few who recognise the value and contribution that can be made by local societies. This has all been discussed by the Trustees who have realised that more training is needed but how this is to be achieved has yet to be decided, ideas are for a teach in on methods and procedures also for a training excavation. Any constructive ideas are most welcome, as to how we get more trained people on site and people to organise and support fieldwork. Also archaeology is becoming expensive because of the need for specialist analysis. This raises the problem of how an amateur society is to fund this, again ideas please. In 2006 we excavated a series of large trenches. T7 against the wood revealed considerable numbers of flint tools, the possibility of stake-holes, and a fire area. Analysis of material from the fire revealed carbonised wood, burnt hazelnut shells and fragments of pottery. The shells and wood were sent to the Rafter Laboratory which produced dates of 4621 and 4764 BP or about 2600 to 2700 BC, the late Neolithic period. Because of the way the alluvial clay had been deposited we were able to distinguish clearly an intact ancient surface with all the finds lying on this surface apparently little disturbed. In 2007 we were encouraged to go back to extend the previous work with trenches T8 and T9 either side of the previous T7. This was a difficult excavation due to plough damage which had just skimmed the top of the Neolithic layer and great credit is due to those on site that this was possible. What was revealed were two bowl shaped depressions connected to shallow channels, many more flint artefacts and more stake-holes Identifying which were stake-holes was difficult due to other similar holes having been made by animal action. The bowl depressions had signs of chemical residue but at that time we had no idea what this was or even if it was ancient. Great care was taken with recording everything and a number of sterile samples were taken. These samples went to OA, UCL and Lampter University for micro analysis. We were staggered by the results which showed that there were chemical residues in the bowl depressions from the treatment of animal skins. What we had found was a Neolithic tannery. The bowl depressions were to soak the skins to remove fat, then finished with the flint scrapers. Some of the stake-hole fill was also analysed which proved to be consistent with the period, some would have been racks for the skins others for shelters. A double line is thought to be a wattle fence to keep animals out. The channels to the bowls were for filling or emptying. Significant though this all is its not the end of it. Pollen analysis and micro morphology of the samples shows that the area at that time was grass with grazing for cattle alongside a creek from the Thames but probably only intermittent occupation. Comparison with OA excavations to the north indicate that the tannery was some distance from the habitation with the suggestion that this was due to the smell. This is all great credit to MAS as there is no other example of a Neolithic tannery with such clear evidence and just shows what can be achieved by amateurs. We have received the C14 dating for one of the bones. This dates the bone spread and its context to AD1249+-39 and this is consistent with other evidence in the vicinity. Another small but important part of the evidence that is building up so as to understand early Cookham. The formal report is expected shortly when more information will be made available. The Parish Council wish to extend the existing cemetery to the south and because of known archaeology in the vicinity have liaised with the Authorities for an archaeological evaluation. The brief from the Authorities states. "The site is identified as being of archaeological potential, due to a number of find spots and sites noted on the SMR for this area. Deposits from a site 200-300m to the south-east for example contain one of the richest sources of Palaeolithic hand axes in England. There are other known deposits within the immediate area that contain Palaeolithic tools. 250m to the west a series of Bronze Age structures, pits, post holes, hearths, a well and a ditch were found during excavation prior to gravel extraction. In addition, 250m to the east a 72 ft Iron Age rectangular enclosure and post holes and later Roman occupation were located during excavation prior to gravel extraction. 270m to the north-east a Roman farmstead was discovered during development. Therefore this is a site of high archaeological potential. Furthermore as the site lies with such close proximity of so many archaeological sites, it is possible that stratified sequences of those outlying activities from those archaeological sites will occur". This evaluation is part of a planning process and therefore formal under the full requirements of PPG16 which requires compliance with all guidelines. A requirement for approval is that any work complies with IFA professional guidelines including being directed by an MIFA. Fortunately MAS chairman Colin Berks is an accredited MIFA MAAIS and the Authorities have approved this for direction of this project. A proposal and representation was made to the Parish Council which resulted in a decision to commission MAS and part fund the project. Discussions have taken place with the Authorities and shortly a WSI will be submitted for approval. It is intended to carry out resistivity by MAS and magnetometer survey by BARG to endeavour to identify significant areas, then to excavate five 20m * 1.8m trenches. Cookham is historically an important location, particularly during the Saxon period and a little later but unfortunately there is no firm evidence. The MAS Paddock excavation, that of OA at Riverdene and the excavations at Odney Club, produced indications that Cookham was a small island in a marsh which was filled in during the 13thC and the village rebuilt and expanded. Because the village is extensively a built environment there is little opportunity for excavation to check or find dating evidence. Julia Martin noticed that there was a derelict area at the rear of the Kings Arms car park, in just about the right position to produce archaeological evidence. We discussed the possibilities with the manager who then spoke to head office, which resulted in approval subject to a formal submission. A document known as the "Burghal Hidage" dated between 879 and 910 depending on which expert you believe, lists 32 Saxon defences. The early ones probably about 871 forming a defensive line along the Thames being at that time the northern frontier of Wessex. One of these is named as "Sceafcesege" and a great deal of intellectual research has gone into showing that this was in the vicinity of Cookham, suggested as Sashes Island although there is no physical evidence to support this. This has significant importance not just for Cookham but for England. These fortifications by Alfred enabled him to defend Wessex and drive the Danes and Vikings back to East Anglia, thereby allowing for the expansion north of Wessex and the start of England as a sovereign kingdom. Later the Kings parliament the "Witan" (Witenagemot) was held at least 3 times in Cookham. Its difficult for as to realise that Cookham in the 9thC was an important garrison and in the 10thC the seat of the parliament of England at the time. There is also nothing known about the 8thC monastery, recorded as the wealthy monastery of Cookham having as abbess King Offa's widow. These things also have great importance for the whole area including Marlow. In 1896 excavations on the north bank at Hedsor by Maidenhead Society, revealed timber structures and many artefacts. Incorrect dating of the artefacts led to the theory that the structure was Roman. In 1947 and again in 2001 the artefacts from the level of the timbers were re-evaluated and shown to be late Saxon. In about 1977 MANCAS carried out resistivity on the north west of the island which revealed a possible bank, also test pits that didn't reveal a lot. There are maps of 1608 which indicate channels but apart from the above, nothing. Minas Tirith Ltd has produced an extensive review of all evidence which reveals interesting possibilities. These have been discussed with the experts, particularly UCL, Haslam and County, with the conclusion that fieldwork investigation is essential and that MAS under supervision should be able to do this. The tenant farmer has agreed access and discussions have taken place with the archaeologist for the Environment Agency who are seeming to suggest a joint venture. A meeting is to be held on site with both Bucks and Berks Arch. Services to discuss the possibilities. The thoughts at the moment are first to check the findings of 1896 and 1977 by geophysics, auger and trial trenching, then to liaise further to agree what might be a major project. This very important investigation will take many years and there is no rush, it has been there for 1000 years so a few more won't matter. This site is about a mile to the south of Marlow between the Thames and an ancient branch of the river adjacent to the Henley Road. This area was an island between these two waterways. Previous work in the area had been carried out by MAS which revealed 3 early Bronze Age Barrows, a Neolithic mortuary area and Neolithic occupation making this possibly the very earliest settlement of Marlow. The excavations by MAS in 2006 of 7 large trenches produced remarkable results with 2 trenches revealing an intact archaeological layer with undisturbed material. This unique situation was caused by inundation of a thick dense clay layer shortly after the ancient occupation which had sealed and protected the archaeology. This intact layer produced a burnt area, carbonised wood and hazel nut shells, pottery sherds, flint tools, some 300 burnt flints and evidence of stake-holes This material went to the Rafter Laboratory in New Zealand which produced a date for the wood of 2815 BC and for the shells of 2671 BC, the range of error gives both a date for this material and therefore all other material on this horizon of 2750 BC or some 4757 years ago. It was a strange experience, peeling back the layers to reveal a surface just as it was this long ago. The combination of evidence and dating caused great excitement by the Authorities and great credit to MAS. It was decided to go back to the site in 2007 to carry out further investigation. Two trenches were opened either site of the productive 2006 trench. The objective was mainly to find out if the evidence for occupation extended further and to obtain soil samples to be analysed by Lampter University for environmental information. The excavation commenced in early August and finished in mid September. The trenches in total were some 20*4m and on average 0.75m deep. This was 60 cu M, some 50 tons of soil all dug by hand. The weather at first was appalling with heavy rain causing flooding both on the access and in the trenches which became ponds and the excavation had to be suspended for several weeks. The excellent organisation was by Joy Blake, it was hard work with sterling efforts from Colin and Christine Smith, also Elaine, Mike and Sally Brough, Ted Sutton, Betty Bell-Smith, Diane Miller, Geogina Lomnitz, Pat Day and other members of MAS. Some 300 further burnt and worked flint was found on the same Neolithic horizon also further stake-holes Interestingly all of this was mainly to the south of the burnt area with little to the north. This tends to support the theory that the occupation was on the bank of a channel, the existence of which was suspected from the 2006 excavation. The south trench T8 revealed a most interesting feature of a large depression possibly water formed but having the appearance of an animal water hole. This depression had filled with sandy clay that formed the Neolithic surface. Subsequently a 1m wide 0.75m deep bowl shaped pit had been dug into this fill, this had to be Neolithic as it started at the archaeological horizon. There were no finds in this pit but the bottom was indicative of water and an explanation might be that it was to obtain clean water. This feature became known as Mrs Neolithic's washing bowl. The north trench T9 produced confusing results due to two deep plough lines that had disturbed the archaeology. Despite this there appeared to be two more pits or bowls similar to those in the south trench. One significant find in T9 was a Neolithic post hole to the north of the burnt area. Several soil samples were taken to be analysed for micro morphology and when the reports are available will be combined with all the other information to produce the SMR report. The excavation was most successful in achieving its objective of confirming and extending the understanding of this early occupation. Great credit is due to MAS and those involved for the hard work and importantly the high level of archaeological technique. Marlow Archaeological Society has carried out five years of investigation on this site leading up to the excavations of 2006. This work was initiated so as to investigate crop marks appearing on air photographs. The previous comprehensive fieldwork involved, survey, fieldwalking, auger and geophysics (methods of revealing features underground by electronic impulse. These investigations revealed that there was a low ridge and that on this ridge were three Bronze Age Barrows and an earlier Neolithic mortuary enclosure. Fieldwalking produced hundreds of worked and burnt flint increasing in density towards the north west of the site. Trial trenching produced more evidence mainly worked flint. All of the flint artefacts were reliably dated to the middle Neolithic. 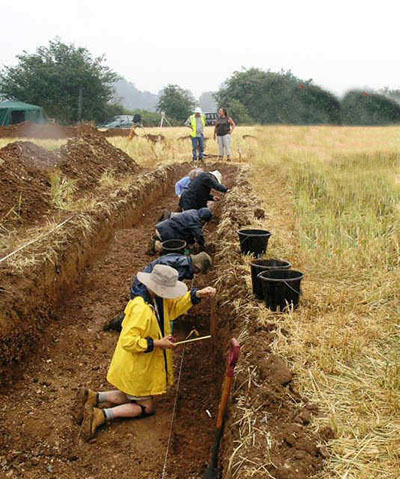 As part of a flood protection investigation the Environment Agency commissioned Oxford Archaeology to excavate 32 trenches to the north of the MAS site. These revealed pits and ditches again dated to the Neolithic some 2500 BC or about 4500 years ago. An auger survey was carried out by MAS along a line from the site to the Henley Road and this showed a paleo channel of considerable size. MAS geophysics had shown vague indications of circular features between the Barrows and the paleo channel. Ground and auger survey indicated that at some time the north of the site was an island surrounded to the east by marsh reaching to where the Thames is now and on the other sides by a large channel being a branch of the Thames. Today when flooding occurs in this part of Marlow it is because this channel is trying to run again. By the start of 2006 significant evidence had built up showing Bronze Age on the top of the ridge but also evidence of earlier Neolithic occupation to the west and north of the island. As this area is on the edge of the site and adjacent to an old out of use track, it was decided, in consultation with the County Archaeologist, that this was the best area to investigate by excavation. Excavation of this type is expensive and an application was made to the Heritage Lottery fund which was granted. Negotiations took place with the owners who were most helpful for one acre to be taken out of production for two months. County required that Oxford Archaeology were commissioned to provide archaeological guidance. Even though there was an old track adjacent it was unused and in very poor condition. The first task was to repair the entrance and 400 m of this track. This was a big job requiring a JCB, roller, 22 tons of crushed concrete, cutters, strimmers and a lot of effort by the members of MAS. Great fun was had doing this and the track was opened for access to the site. In August the excavation started with 3 trenches 20 m long and 2 m wide towards the centre of the site. This required a 3 ton tracked excavator which struggled due to the dry ground. The machine excavated down to signs of archaeology or natural, then the excavation was by hand by the many volunteers. These first trenches were disappointing in exposing little archaeology. One trench (T1) revealed a post hole (possibly Bronze Age) but no datable material. Subsequent plotting showed that this post hole was consistent with features on the geophysics. Also a small washed out channel (probably glacial). A conference was held with County and Oxford Archaeology when it was decided to excavate 4 more large trenches towards the edges of the site. This started to produce results but the drought was making things difficult and a 5 ton tracked machine had to be used. The trench (T6) closest to one of the Barrows produced flint tools including a projectile point (probably spear). The trench running north (T3) whilst no archaeology was found showed a clean channel filled with sandy clay. A trench (T4) adjacent to the north produced what appeared to be a ditch running from the channel in which was found worked flint. The trench (T5) on the north east boundary was all in the sandy clay producing many worked and burnt flints. A small section of this trench was dug down to water level which was on the underlying gravel. When exposed the water could be seen running quite fast in a direction towards the paleo channel. The last trench (T7) was where we had major archaeology. The end of this trench revealed a burnt area, small circular stake-holes, and many burnt and worked flints. The line of stake-holes seemed to be running towards the west and this trench was extended in this direction by JCB. We were now into September and it was becoming very dry and hot. The west end of this trench was in the sandy clay which dried like concrete when exposed and almost impossible to trowel. Considerations of the dry hard ground and of health in the hot sun caused us to back fill all trenches except the west end of T7 and suspend excavation to await some rain. Fortunately after about 2 weeks the weather was cooler and there was some rain. This created ideal conditions and trench (T7) was continued. It was found that there were layers of sandy clay, the upper layer being more dense and impervious. When this layer was carefully removed we found a surface on a more sandy layer with many artefacts laying on this surface. A complete sample of a section of these layers was taken and this with other information when analysed produced significant information. It appeared that the surface on the more sandy clay was an intact, undisturbed Neolithic surface. This had been sealed intact by a subsequent inundation creating the more dense overlaying layer. Adding to his unique situation it was realised that this area was the plough headland where the plough had always been lifted which was why the archaeology was undisturbed. The burnt area appeared to be a fire and carbonised wood was found. The exact position of all artefacts were carefully recorded then placed in sealed bags. When plotted the burnt flints, a line of larger unburned flints and pot boilers appeared to be associated with the fire area, as if they had been dragged from the fire. A large sterile sample was taken from the fire area for subsequent analysis. When plotted the stake-holes appeared to be in a regular pattern but the function was not clear, perhaps wattle and brushwood fences or screen or a small hut. All the flints were subsequently dated to middle Neolithic. The large sample from the fire area when analysed produced amazing results. It was found to contain a smashed burnt pot and carbonised hazelnut shells. The pot was dated to Neolithic and the shells sent to the Rafter Laboratory in New Zealand for carbon 14 dating. Two dates were reported both having considerable confidence, one of 2672 BC the other 2815 BC both +- 40, the mid within the range being 2744 BC. Whilst the excavation started with disappointment at the lack of archaeology in the end this was made up for with the results from a (T7) with the unique situation of an undisturbed prehistoric occupation surface plus the bonus of material that could be accurately dated. Consultation is now taking place with County to go back and extend (T7) as research into other similar sites shows that there should be evidence of habitation in the vicinity. 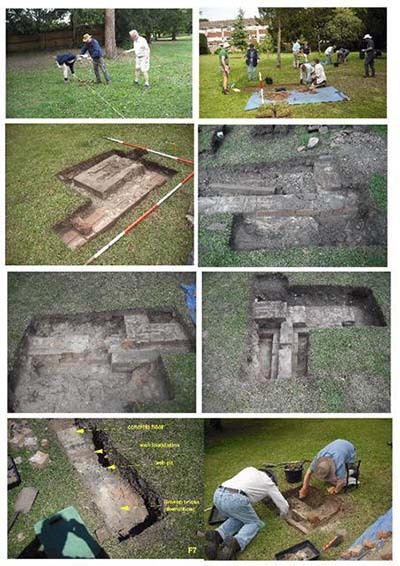 The organisation of such an excavation is complex, the results show that the highest standards were used, at times more than 30 volunteers were working on the site. All showing that great credit is due to the organisers and members of MAS for their time, dedication and professionalism.